I was absolutely thrilled when inspiring girl boss (& friend! ), Amanda, of She Did It Her Way asked me to be on her podcast. I think so often, we look from the outside in at bloggers and business owners and just see the pretty Instagram photos. You don't hear the story and struggle behind the brand and the steps they took to get there. That's why I love her podcast so much. It's just as much about the journey as the business itself! Take a listen to my podcast where I share the story of taking the leap from fashion merchandising to social media consultant at Social Media With Style. I chat about the changes in direction I've taken and the goal of giving myself grace when things don't go exactly as planned! If you're a fellow dreamer or perfectionist, I think you'll be able to relate to my story. You can also listen to the episode on iTunes or Stitcher! I'm so thankful for the support of my small business journey from friends, family & blog readers alike. 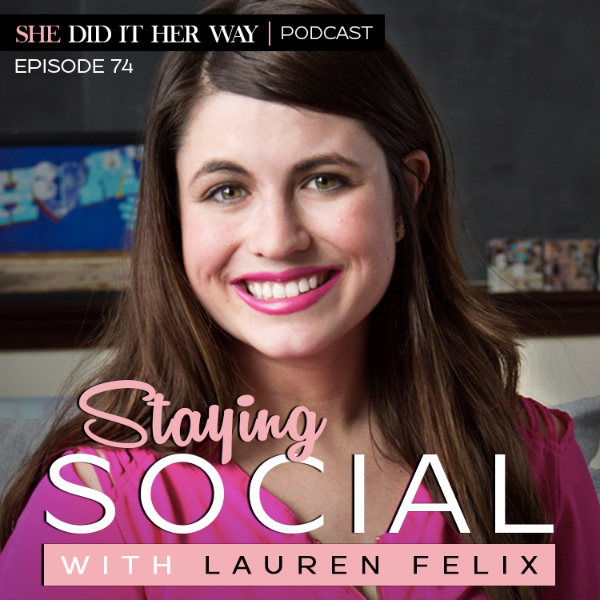 I'm so honored to be a guest on She Did It Her Way; a podcast filled with interviews with so many of the entrepreneurs I respect & am inspired by! Working with other business owners to help them grow their social media presence and define their brand aesthetic has been an absolute dream. I can't wait to see where we take things! Interested in working with me in a social media consulting session? Check out my She Did It Her Way episode page for a special deal! I love listening to She Did It Her Way Podcast -- I haven't heard your episode yet! It's great to hear how successful women get stuff done, make decision and build such successful businesses! Hope you had a good weekend girlfriend!